English seaport; center of the English coal-trade. It has a population of 214,803, including about 500 Jewish families. Jews are mentioned in connection with Newcastle-upon-Tyne before the expulsion, but the present, community dates not much further back than 1830, in which year seven Jewish residents entered into an agreement to defray the cost of a burial-ground. On the New-Year of 5592 (=1832) these early settlers met at the house of David Cohen in Westgate street; the day being also the coronation day of William IV., a sermon was preached by Martain Valintine of Poland, and subsequently printed. The service was performed by Henry Harris (father of the Rev. S. H. Harris of Ramsgate), who subsequently became minister of the congregation. The congregation was formally established on Oct. 8, 1832, and David Cohen became its first president; it thereupon migrated from place to place until, in 1838, the first regular synagogue was erected in Temple street. By 1868 the synagogue had become too small for the increasing community, and another congregation was formed under the presidency of J. de Hart, a place of worship being acquired in Charlotte square. In 1873, through the efforts of the Rev. A. L. Green, an amalgamation was arranged between the two congregations. 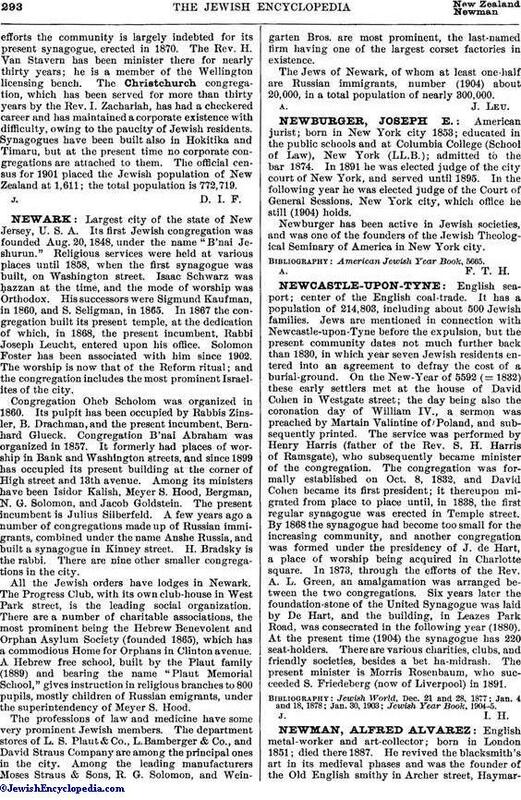 Six years later the foundation-stone of the United Synagogue was laid by De Hart, and the building, in Leazes Park Road, was consecrated in the following year (1880). At the present time (1904) the synagogue has 220 seat-holders. There are various charities, clubs, and friendly societies, besides a bet ha-midrash. The present minister is Morris Rosenbaum, who succeeded S. Friedeberg (now of Liverpool) in 1891.